Almost a year ago, Andrew I welcomed Baby Boy Green #2 to the world! It’s hard to believe it has almost been a year, and I am just now getting to posting his nursery pictures…well, his former nursery! When you own your own business, have two young boys, and tackle renovating a new house and moving, some things (like the blog) get put on hold. We moved to a new house back in April, so it makes me a little nostalgic to look back at this pictures. His new room is similar, but a work in progress, with a few boxes still to be unpacked. It took a little finagling, but I somehow convinced Andrew that we needed to redo this room. I think there were phrases like “This is going to be our last nursery that I design”, “It won’t be that much more painting for you”, “Boy #1 needs his nautical theme to go with him to his new room.” So, that’s what we did – moved Boy #1’s décor to the bigger room with him, and I started to gather new ideas for the nursery. When I started searching for inspiration last January – mint green was nowhere to be seen. Now you can’t walk into a store without seeing it on every isle! I guess I was just ahead of the trend ;). 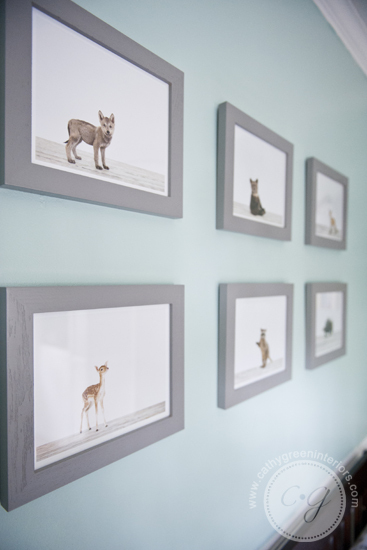 My jumping off point for the room was these adorable photographs of baby animals from The Animal Print Shop. I pinned them years ago in hopes of using them for a project someday, and decided that there was no better place for them then our own home! Once the woodland theme was decided on, I needed a color palette to coordinate with it. We settled on this tree fabric for the window treatments, and pulled the mint green (Olympic Rolling Hills B62-2) for the top half of the walls from there, and kept it soft with light gray accents. The dresser was a perfect fit for the space between the wall and the radiator, so we kept it in the room and gave it a fresh coat of paint (Sherwin Williams Passive SW 7064), and Boy #1 got a “new dresser for his new room”! 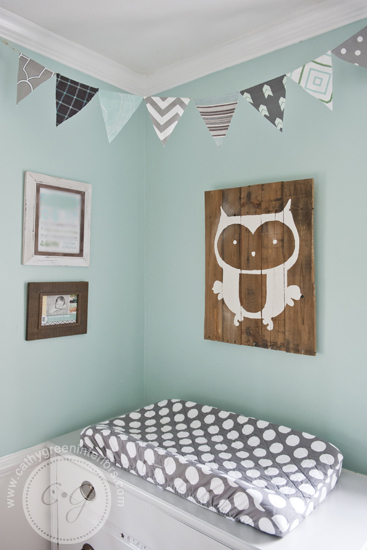 The reclaimed wood owl is from The Cheeky Nest on Etsy. They were so wonderful to work with and created exactly what I had envisioned! I made the pennant banner from scraps of fabric after Boy #2 was born. (He was 3 weeks early, so I had expected to have a little more time to finish his room!) The two pictures on the wall are his birth announcement, and a name sign with all of his birth information. The changing pad cover is from Land of Nod. We kept the door to the closet off of the hinges, and we were able to reuse the gray baskets from Boy #1’s nursery to hold baby blankets, sheets, and toys. Boy #1’s crib converts to a toddler bed, so we decided to let him keep that one, and found this one off of CraigsList (I think it is this one). It was in great shape, I loved the straight lines of it, and the storage drawer was an added bonus. We hung 6 of The Animal Print Shop’s photos over the crib (wolf, raccoon, deer, bear, fox, and porcupine a.k.a “porky-pine” as Boy #1 calls it ;)! ), and added the owl near the door. Two other things we kept from Boy #1’s version of the room were the wall shelves on either side of the crib and the light fixture. Oh, Etsy…what did I do before you?! I wanted a similar mobile to the one we made for Boy #1. I found Sweet Bauer Knits’ shop and loved her little knitted animals. It was once again, a delightful experience, and she worked with me to create the animals and colors exactly like I wanted (taupe bear, gray fox, lime green owl, brown hedgehog, soft green bird (behind the fox), and a few acorns). I added the same felt balls I used with Boy #1’s mobile and put it together on an embroidery hoop wrapped in gray ribbon. The view I had every time I walked in the door. And then this sweet face was there to greet me ;). He was about 4 months old in these pictures. It was fun to re-do this room and give it a new look. It was a tiny little room, but I have such sweet memories of our time in there. I certainly spent many hours in there with both boys. I really loved the navy and green version (and it is quite popular on Pinterest with over 26,000 repins!! ), but this soft and sweet mint green and gray was also special to me. I’ve been asked, “What is your approach to design?” It is an always evolving answer that combines trends, my own personal experiences, and the client's needs and wants, but one thing that stays constant is this: I see the world in color. Everywhere I go, I notice colors, and patterns, and shapes. The colors I see are used to influence projects and create new room designs. With my friends and family, in my head, I assign them a color that is ‘their color’. It represents who they are, their personality, and what makes them unique. These two versions of the same room have come to reflect each of our boys’ personalities. Boy #1 will forever be ‘navy blue’ in my head – rich and bold, strong, and full of depth. Boy #2 will carry the light green and gray – he is more sensitive and observant, soft and cuddly, yet ready to explore the world as his woodland theme suggests. Which version is your favorite? Client Reveal ~ Coming Soon!